Israeli soldiers seriously injured, Friday, a young Palestinian man after shooting him with live fire in the chest, in Jabal at-Taweel area, east of al-Biereh city in central West Bank. Medical sources said the young man is in a very serious condition, due to a gunshot wound to the chest, and adding that he is receiving treatment at a local hospital. 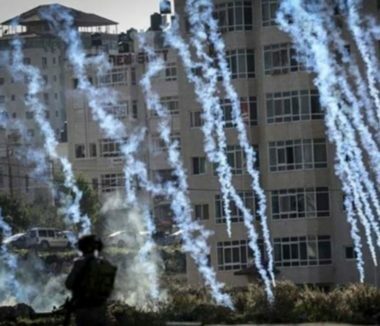 The incident took place after dozens of soldiers invaded Jabal at-Taweel area, where dozens of Palestinians held a procession. The soldiers came from their base in Psegot illegal colony, which was built on private Palestinian lands in al-Biereh. They fired many live rounds, gas bombs, concussion grenades and rubber-coated steel bullets at the protesters, and at many surrounding homes.